On Friday, Oct. 12, 2018, the Tijuana Xolos played Dorados de Sinaloa at the Estadio Caliente for a friendly match. 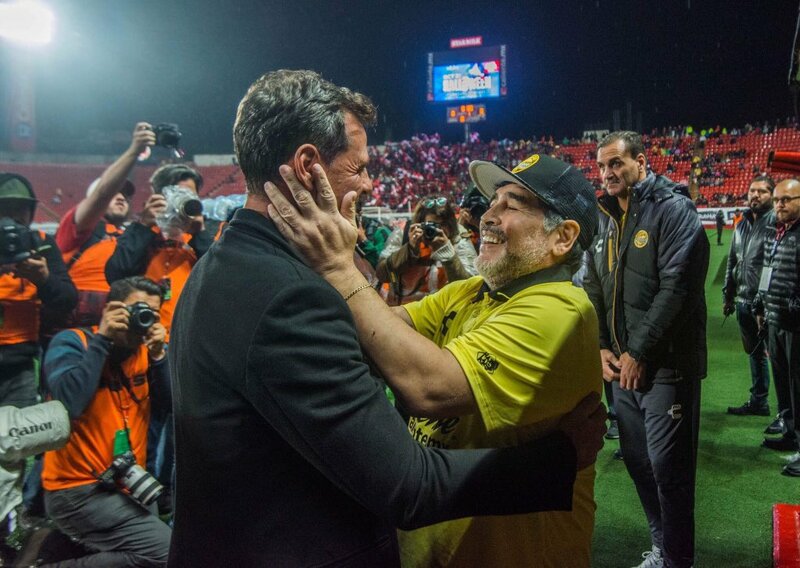 The game was set to be an enticing duel as the current manager of Dorados is Diego Armando Maradona, one of the best soccer players to have ever graced the earth. The atmosphere was lively at the Mictlan as the fans had Maradona fever and several Argentina jerseys were spotted in the crowd. The Xolos’ supporters group, “La Masakr3”, also shined on a rainy night with a plethora of smoke bombs and flares that filled the air in the stadium. Maradona was received with praise and respect, and not a single jeer was heard from the crowd when he stepped onto the pitch. The Argentine icon was energetic and put on a show for the fans throughout the encounter as he danced, shouted orders, and even argued with the referee with no retaliation whatsoever. The game was exciting as both teams had plenty of scoring opportunities in the first 45 minutes, but neither found the back of the net. The first half ended with Dorados’ goalkeeper Gaspar Servio pulling off a double save to deny the Xoloitzcuintles of a goal. The second half picked up where the first one left off as both teams continued to be aggressive, but neither could find the back of the net. The first and only goal of the clash finally came in the 80th minute as Edson Rivera scored to give Dorados the slim 1-0 victory. The result was a disappointing one for the Aztec Canines up against their second-division affiliate. But not many fans left the Estadio Caliente disappointed with the spectacle of the game, and what made it worthwhile was seeing the legend that is Diego Armando Maradona. Maradona left the game happy, but Diego Cocca, on the other hand, has many problems to resolve before thinking of the playoffs. Erick Torres, Eryc Castilo, Juan Martin Lucero, and Jesus Angulo were all very ineffective going forward in this match. The attack has been a serious issue and looks like it will remain a serious one to round off the season.